“The space has exploded,” Gary Bechtel of Money360 says on the financing panel at RealShare Apartments. 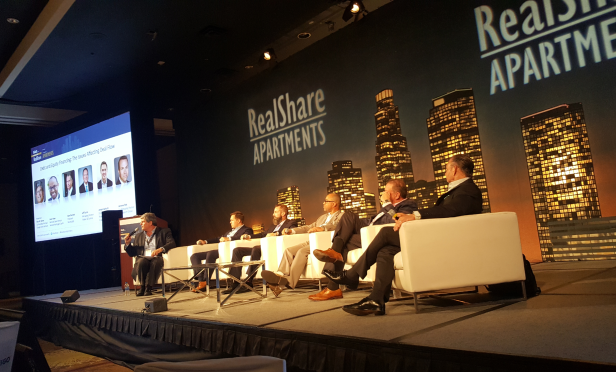 The bridge lending space has exploded, Gary Bechtel, president of Money360, said on the Debt and Equity Financing: The Issues Affecting Deal Flow panel at RealShare Apartments this week. He estimated that there are 130 to 150 bridge lenders in the space, serving a wide range of spreads and deals. Gary Tenzer, co-founding principal at George Smith Partners; moderated the panel, which included speakers Jordan Goforth, director of Ready Capital Structured Finance; Jerome Fink, co-managing partner of The Bascom Group; Jason Haye, national sales director at Velocity Mortgage Capital; and Jeff Burns, managing director of Walker & Dunlop, along with Bechtel. Goforth and Fink are seeing the same growth in the bridge lending space. Goforth said that deals with strong cash flow are, of course, the most popular and are getting bid down; however, even bridge lenders even have a strong appetite for deals without cash flow. “Competition on all of these deals is huge,” he said. Fink added that even with the increase in bridge lenders, he hasn’t seen any lender that hasn’t been able to perform. Instead, he said the biggest challenge is filtering through the amount of bridge debt available.